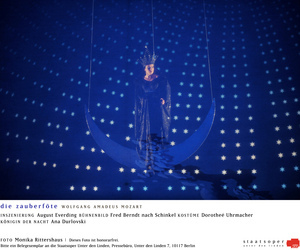 As Regietheater becomes the norm on opera stages in Germany, it is a pleasant, if not shocking, surprise to see a production of Die Zauberflöte that looks like a throwback to the time of its world premiere. The Staatsoper Berlin has revived a 1994 staging modelled after designs by the nineteenth-century Prussian architect and landscape painter Karl Friedrich Schinkel, primarily remembered for his Royal Theater (now rebuilt as the Konzerthaus) on Berlin’s Gendarmenmarkt. Schinkel’s sets were commissioned to commemorate the crowning of Friedrich Wilhelm I on January 18, 1816, 115 years after the inauguration of Friedrich Wilhelm I. In contrast to the production’s huge success with the audience, the prince was reportedly not pleased with the results of this investment of royal funds. “In the future I won’t mix my opinion into administration affairs,” he wrote to the General Intendant of the Royal Theater. While stage director August Everding and his team emphasize in program notes that it would be impossible to recreate Schinkel’s vision, as we cannot travel back in time to witness certain conventions in mimic and gesture, they hope to have shed new light on Mozart’s opera in the very city that is home to Schinkel’s neo-Classical creations. The Staatsoper’s current home in the Schiller does not benefit from the 18th-century splendour of the company’s headquarters on the Boulevard unter den Linden, which are currently under renovation, but painted sets by Fred Berndt and costumes by Dorothée Uhrmacher (seen November 9) immerse the audience in an aesthetic that faithfully evoke the mythic realms of the Queen of the Night and Sarastro. The Queen descends for her first aria on a crescent moon against a starry sky while sets representing the rocky terrain on which Prince Tamino arrives part seamlessly to the side. Sarastro’s priestdom emerges with trompe l’oeil paintings of the Egyptian-inspired architecture indicated by Mozart’s librettist, Emmanuel Schikaneder, with expert lighting by Franz Peter David to give the sets depth. In what could easily offend modern viewers, Monostatos and his gang are represented with blackface as a group of violent thugs, while the three boys first emerge with a unicorn. Surreal animals ushered in by the magic flute bring a further touch of childish charm. The feathered Papageno and the family he joins at the end of the opera also made for humorous moments, even when the libretto was doctored with contemporary gags, such as the bird catcher’s response to Tamino that they are in the Schiller Theater. In a strange twist to the usual constellation, the evening was not as even musically as it was theatrically. The conductor Julien Salemkour, an assistant to Music Director Daniel Barenboim, gave a somewhat perfunctory performance with the Staatskapelle, often hammering out notes without enough dynamic nuance and rushing the ends of phrases. On a few occasions he also did not coordinate smoothly with the singers. The performance gained intensity and authenticity starting with the more subdued, neo-Bachian passages that usher in Tamino and Pamina’s trials through fire and water toward the end of the second act, but could have used more elasticity in the final chorus “Heil sie euch Geweihten.” Having heard the orchestra in Don Giovanni and Le Nozze di Figaro under Barenboim last season, I know the musicians are capable of better. The visceral, legato singing of René Pape in the role of Sarastro only emphasized how much more attention to line this deceptively simple score deserves, particularly in his aria “In diesen heiligen Hallen.” Pape is surely one of the best Sarastros of his generation, if not the past century, grounding the role with solemn spirituality. The Slovakian tenor Pavol Breslik also gave a beautifully sung performance in the role of Tamino. The streetwise mannerisms of Adriane Queiroz may not have always evoked the innocence of Princess Pamina, but her lush soprano colored ensemble numbers with reliable warmth. 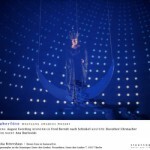 She was also affecting in the scene in which Sarastro forbids her from taking the vengeful orders of her mother. As the Queen, Anna Siminska reliably hit the stratospheric staccato notes of her arias but struggled with intonation as she prepared for the climax of “Der Hölle Rache” and did not capture the character’s menacing seduction. Roman Trekel animated the show with well-sculpted tones as Papageno and a keen sense of comic timing. He found a fine match in his Papagena, Narine Yeghiyan. In the role of Monostatos, Michael Smallwood was equally convincing with a clear, high lying tenor and humorous presence. The Three Women (Carola Höhn, Rowan Hellier and Anna Lapkovskaja) formed a compelling ensemble, as did the Three Boys (of the Aurelius Sängerknaben) despite difficulty following the conductor in their last scene. The guards of the pyramid (Kyungho Kim and Alina Anca) stood out among the male comprimario roles of the priestdom, and the chorus provided well-balanced singing, particularly in the second act. As mythical animals waved at the audience during the final bars, one had the feeling that Mozart and Schikaneder might approve of a production so respectful of the artistic principles that have proved their popularity with audiences time and again. This entry was posted on Friday, November 16th, 2012 at 9:37 am	and is filed under Berlin Times, Uncategorized. You can follow any responses to this entry through the RSS 2.0 feed. Both comments and pings are currently closed.